It’s easy to say you’ll save money for the holidays each year, but harder to put into practice. I, for one, always think I’ll start early – like in January. Then, by the time it rolls around the next year, I’ll be ready and less stressed both financially and otherwise. But it never seems to work out that way. By the time the holidays are over, I’m tired, stuffed, and ready to put the decorations away. As far as starting on stuff for the next year, like saving or crafting, I just never seem to get it done. Are you like me, resolving to start early every year but not quite putting it into practice? If you are, there’s still time to DIY and save money for the holidays. Here are some ways you can. One of the best ways to DIY and save money for the holidays is by making gifts for others. Many people have hobbies that they have gotten quite good at, but don’t tap. If you have one of the following hobbies, use it to make gifts for friends and family and save money this year. Whittling may be an old fashioned hobby, but some people still enjoy it and are quite good at it. If it is something you like to do, try making small gifts, like ornaments. Of course, you can make larger items too, such as figurines, bowls, pitchers, jewelry boxes, and many other things. Remember, your imagination is only limited by the size and kind of wood you have available. Some people who like to weave baskets, rugs, bowls, and other items for fun in their spare time. For instance, several years ago my daughter created a bowl that we still use and treasure today. Having talent in this area, whether with grasses, vines, or cloth, could be your ticket to save money this year. What’s more, you’ll have fun doing it while you save money and make treasured items others will appreciate. 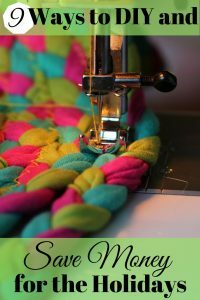 Do you have a sewing machine and know how to use it? If you do, it can help you save money for the holidays. You can stitch up blankets, quilts, clothing, toys, and many other useful items to give as gifts. 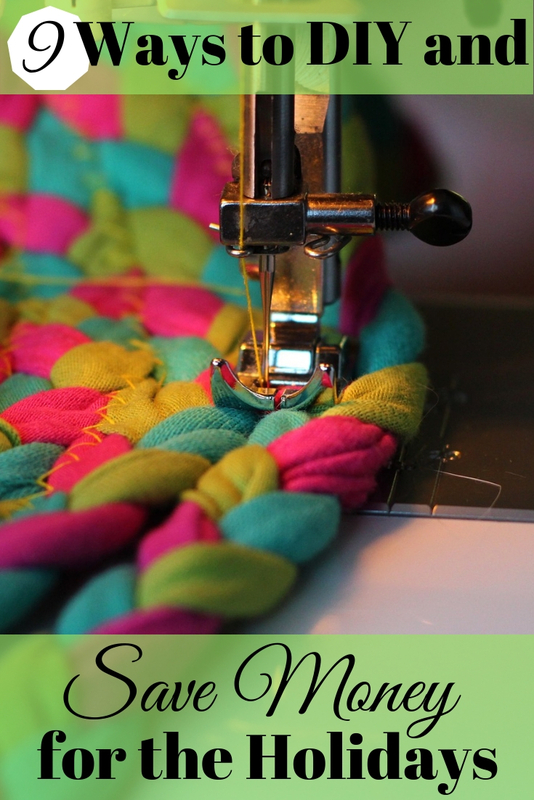 Furthermore, making gifts yourself can help you declutter that fabric stash you’ve collected. Yes, even coloring could help you DIY and save money. If you have a talent for choosing color and know how to shade, create art for others to enjoy. Add a homemade frame or choose one from a flea market and you’ve got a great, inexpensive gift for someone. Who doesn’t absolutely love baked goodies for the holidays? Nearly everyone does. If you have a knack for baking, use it to cook up some great gifts. Whenever possible, make baked foods ahead and freeze them for a few weeks. If you package them carefully, they’ll still be fresh and in good shape for holiday gifts. In the long run you’ll get to DIY and save money for the holidays. Many years ago, my half sister and her husband created a family book that traced our genealogy back to the late 1700’s. It turns out, I am descended from a Cherokee Indian princess! Who knew? Obviously, a genealogy project like this takes time. However, if you’re already into it, and have the information, why not put something together for a gift? By using talents and knowledge you already have, you can DIY and save money while enjoying the holidays. At the same time, you’ll be giving a priceless gift to a family member. The cool thing about having hobbies is you can also use them as a side hustle to make extra money. In other words, you can sell stuff you make. That’s a great way to DIY and save money for the holidays. As an example, while you are baking for yourself, bake things for others and post about it online. Give out free samples to family and friends. Using these tactics you’ll have plenty of orders in no time. The things you DIY don’t have to be for yourself or for others as gifts. You can DIY and save money for the holidays by selling what you create. Make decorations that other people can buy and use in their homes for the holidays. Try making ornaments, garlands, pillows, quilts, blankets, and many other things. Advertise online through Facebook and local selling groups or even your own website. One of the things so many people lack during the holidays is time. Why not help them out and save money for the holidays too? Offer to decorate for others, wrap gifts, babysit, or shop for other people. There are plenty of things you could do to make money by selling your time. Another way you can DIY and save money for the holidays is to create your own things. Sure, you aren’t making gifts or selling stuff for extra money, but you’re still saving. Instead, just say, “no”, to store bought, expensive decorations you’ll have holiday décor to treasure for years. Clearly, there are plenty of ways to DIY and save money for the holidays. By choosing to DIY you can save money and be less stressed this holiday season. It’s not too late to try a few of these ideas out for yourself and save money this year. Do you DIY and save money for the holidays? Why or why not? Well, these are valuable money saving tips. I never would have thought of Genealogy. That is a new one to me, but shouldn’t be too difficult for me. Yeah, I thought of that one because I have a couple of family members into it. I would love to be, too. However, I lack the time. That’s where my idea came from to do it for someone else as a gift. If you are already into it anyway, and have someone on your list who would love it, it could save you some money to do a cool family tree (or something else similar) for them. Well, these are valuable money saving tips. I never would have thought of genealogy. That is a new one to me, but it shouldn’t be too difficult for me. Yeah, that’s kind of a bit outside the normal box for most people, I think. At the same time, what a valuable gift it could be for those who truly appreciate that history, etc. The idea, of course, is to play to your strengths, save money, DIY, and still give something the other party will value. It can be kind of fun because it makes you really think about that person and what you could give them that they would treasure.